“Good afternoon everyone. Thanks for coming out today. 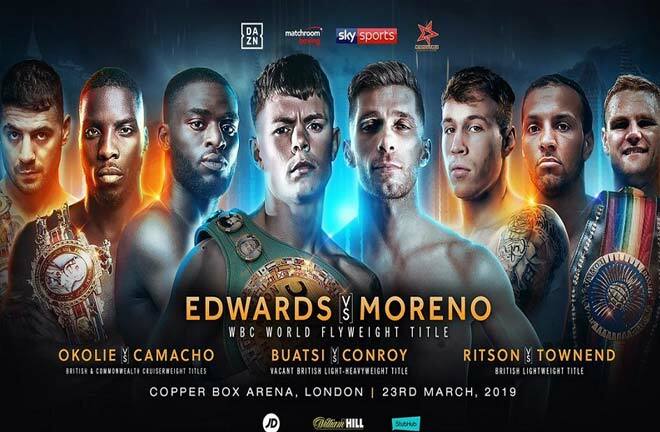 This is our first press conference for our big March 23 show at the Copper Box Arena, live and exclusive on Sky Sports in the UK and DAZN in the US. “We’re coming off the back of a great night, but also a disappointing night at The O2. 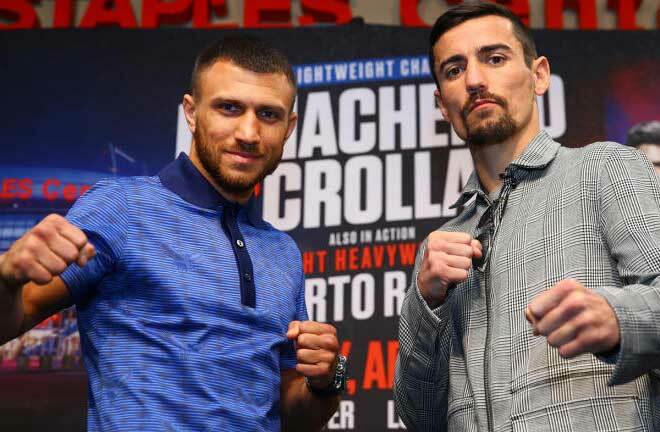 We talk about the new era of stars coming through in British boxing and one of those stepped up on Saturday night, he wasn’t good enough and might not have been ready but he took the challenge and came up short against a very good champion in Sergio Garcia. “I agree with Eddie. The night at The O2 wasn’t quite what we wanted but how brave was Ted Cheeseman and what a find in Sergio Garcia, a terrific performance. What a fantastic card this is on March 23 at the Copper Box Arena. It really is a stellar night. We’ve got the one in Liverpool the week after as well but I think this one has got something for absolutely everybody. “It’s terrific to see Charlie Edwards defending his World title for the first time against Angel Moreno. What a brilliant story Charlie has had. He’s showed that if you fail once, you can come back and rebuild and believe. 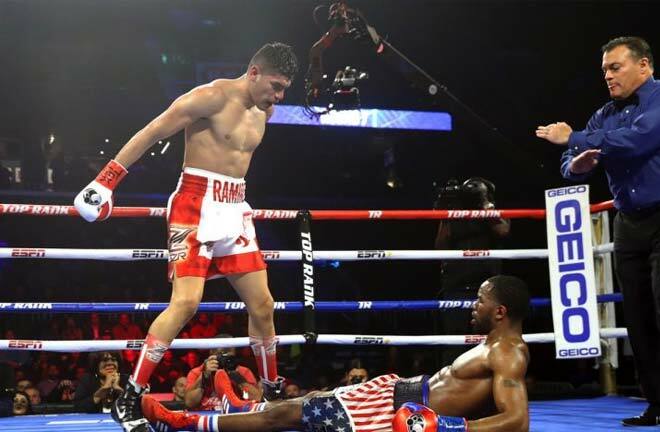 The passion he showed, the emotional scenes afterwards in the ring were incredible and then he he joined us on Saturday night as a pundit on Sky Sports and he did very well – it was a breath of fresh air. “First and foremost I want to say a big thank you to Eddie Hearn for believing in me and a big thank you to Adam Smith for letting me headline my own show. This is a dream come true in itself. And not only that, I’m headlining my own show but I’ve got some great fighters and great former teammates on the card as well. I feel really lucky and blessed. “I want to be a British great, and to be a British great I want to be a multi-weight World Champion, and this new book, it starts now. “The hard work really starts now, and it’s about dedicating myself. I’m obsessed with the game, obsessed with getting better, day in, day out. “I want to go down as a great, and this first defence is going to be a really good one. I’m really looking forward, and excited about this fight. Angel Moreno is a very good fighter. “First and foremost, I’ve got to focus 100 per cent on Angel Moreno, he’s a top-class operator and a hard fight. But I believe, and I’ll put it out there, this is my time. Timing is everything and it’s all come right. “Thank you very much. This is a great opportunity to come here and challenge Charlie for his World title. Charlie is a great boxer and anything can happen on the night. “It was a brilliant night. My first World Champion. On a big scene like that. It was absolutely brilliant. I knew how much it meant to Charlie and his whole team. It was so emotional for us all. We still speak about it now. It was just absolutely brilliant for us all. I knew he could do that. “I’d like to congratulate Shannon for turning professional and making her debut on March 23. We must congratulate this man to my left Charlie Edwards for wining the World title. Again, it’s not about the opponent. It’s a title that I want to win, it’s part of the journey that I’m taking. Conroy is the man that’s been put forward and on March 23 it’s going to happen. I’ll be doing everything within my will and my power to win that title. “I’ve been putting in the work in the gym and I’ve been getting sparring that’s been more than ten rounds. I’ve been putting in the work physically and mentally and as my trainer will say, as the runs go on I get better and better. They might think that I’ve only done three one rounders but that’s cool, I’ll be prepared, I’ll be there from one to twelve so whichever number it is, if I see the opening I’ll take it. If it’s the first round it’s the first round. Don’t be surprised it it’s the first, it could happen again. “This is a massive fight but I think it’s been a long time coming. I won my British title fight eliminator in 2017 and I’ve just been working relentlessly since. This has always been my goal. I’m just dead grateful for being on the show. I’d like to thank Matchroom for putting on the show against Buatsi, but it’s not about the opponent, it’s about my journey and the British title is my dream so I’m going to give it everything that I can and keep on going relentlessly till the final bell. I won’t stop until I have that belt. “Like I say, it wasn’t about the opponent, it was about the title and I think no matter who the opponent was I would have taken the fight. People seem to think that I’ve been given something here, being in this fight but I haven’t been given anything. I’ve kicked down all of these doors and I’ve made myself mandatory challenger to the British title. “For me, Saturday wasn’t really about the guy I was boxing. It was about myself and how I felt in the ring, if I could I do stuff that I’d practiced in training. I was able to do a few of those things that I’d practiced in the gym and I look forward to doing the same again on March 23. “Obviously it’s good that Wadi has taken the fight but him along with most of the people in my weight class in Britain just like to talk online and it is obviously frustrating for me. On March 23 I will demonstrate to him and all of the other Cruiserweights in Britain what I’m about. I think stopping Wadi is a formality for me. He’s got the sort of style that will leave him open to me knocking him out. I want to do it in a more systematic way. Maybe go in southpaw and practice different pattern movements. I want to go in there and show him that he’s a practice fight for me as opposed to a 50-50 fight. “This fight will definitely end in a knockout. Wadi is a southpaw so it’s very good practice for stepping up to the Lebedevs and other World level guys. I’m very happy with the fight and happy with where I’m at mentally. I’m not overlooking Wadi, I’m going to train extremely hard for him and deal with him accordingly. “Good afternoon everyone. The mind is very powerful. I used to do a lot of things by myself but now I’ve got a great team around me that have really pushed me and I truly believe in myself. I feel like I have been reborn in my last two fights. I’m constantly improving and on March 23 everyone will get to see another win. “You have to give Lawrence props. He’s come from Team GB and had 11 fights and picked up all of these belts. In some fights he hasn’t been good but I’m not there to pay attention to what he’s done and what he’s doing. It’s all about me. Everyone knows that I’m an awkward fighter and everyone knows that I’m an entertaining fighter – I’ve never been in a dull fight. I always give it my all.